Our time here in South Dakota is quickly coming to an end. When we arrived the end of August thinking 6 weeks was a long time but now with only a couple days left we wonder where the time went. Granted our days were busy with working on the property and visiting but time just seemed to fly by. Jim and Brenda Jordan arrived on Thursday the 14th, a few hours after the Belisle’s departure and we put them to work almost immediately. Our latest visitors Jim and Brenda! Still discovering the best eateries in the area we went to the catfish fry Friday night at the Hitchrail in Pringle with Rudee and Phil from Custer as well as the Jordans. It was no shore lunch of Canadian walleye but both the fish and company were good. We were amazed at how much Jim and Brenda had in common with Phil and Rudee. Both had belonged to different chapters of the same motorcycle club and even though they lived more than a thousand miles apart, they had attended some of the same events and had probably walked within feet of each other. Now years later they met in Pringle, South Dakota…..what are the odds? Next up was a trip to Custer and the Purple Pie Place! It is well worth the visit if you are in the area, both for the food and the pie. While in Custer we took in some of the sites..... Did you know there is a herd of buffalo roaming the streets of Custer? Almost every street corner has one. We were not able to capture every one on camera but we got a few! Kevin arrived Saturday morning and so started a busy week of working on each other’s property. 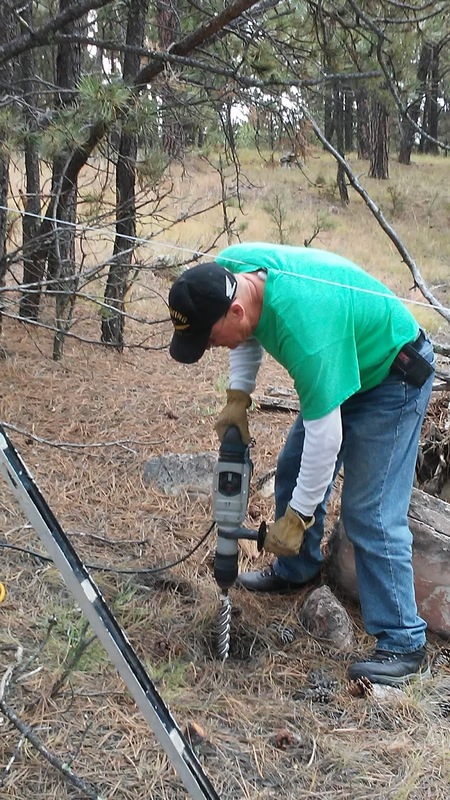 He had brought a hammer drill with a 2” bit so we spent several days drilling holes into the rock so we could eventually get T posts into the ground. Some of the holes went good while others took up to 20 minutes to get down the 24”s. When we return in November we should be able to pound the T posts in and finish this project. Barb and Brenda were busy with their own project which involved tearing apart an old wooden fence that was on the property. Barb hopes to use some of the wood for a feature wall in the house so they carefully took the fence apart and stacked the wood on a pallet. We have also been kicking around some different names for the property. Being in the west (or at least western South Dakota) we are thinking of something with a “-“ (bar) in the name and since it fits in with Barbs name, all the better! We are thinking of J - - (pronounced J bar bar), or J – B (pronounced J bar B). Still thinking about it but we are leaning towards the last one….. Meanwhile over on the Filip estate Kevin was doing some grading to level his building site and getting his driveway in! Once his site was done the same excavator came over to our place and started leveling our site. This meant that we had to move to another part of the property and live “off grid” for a few days until our site is ready. When we come back in November we should have sewer and water right at our site! 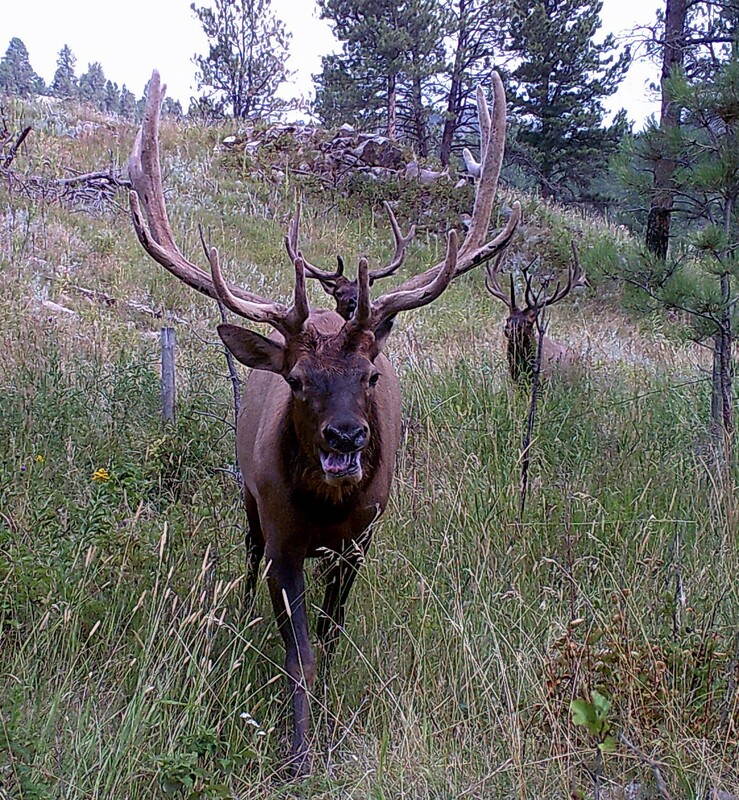 But the biggest excitement for the week was the fact that bow hunting opened on Saturday the 23rd. We had seen a couple of nice bucks on the property with one of them definitely being the one I wanted if the opportunity presented itself. This is the one I wanted!!! Opening day arrived and it was cold, overcast and rainy but with only 3 days before we headed to North Dakota I headed to my stand at 5am an hour before first light. While I was waiting for the sun to rise I heard a deer walk by near where the trail camera was positioned. It was still too dark to see it but in my mind I just knew it was the big one! As the night turned to day, I saw 3 smaller bucks and several does and when I headed in at 9:30 for a break (I was wet and freezing!) I grabbed the SD card out of the camera in front of my stand. When I got back to the camper and looked at the pictures….sure enough, the big guy had walked by just before shooting light! Still raining/misting I went back out at 11:30 with plans to sit until sunset. I saw two of the same smaller bucks from the morning but not the big guy. Then around 3:30 I noticed movement off to my right and there he was! Walking through the woods about 40 yards in front of me, I drew back my bow and waited for him to stop. He stopped several times but he was behind some brush the arrow would never make it through but just when I thought I could not hold the bow back any more he stepped forward into a clearing and I released the arrow. Almost immediately the buck turned and ran but it looked like the arrow hit where I wanted it to. I got down out of my tree and went to the spot where he was standing to see if I had hit it but found nothing…no arrow, no blood….nothing, just some tracks of him running away. I followed the tracks for 50 yards expecting to start seeing a blood trail but found nothing. I spent an hour scouring the trail looking for my arrow or the tiniest speck of blood…nothing. Did I miss? Did the arrow hit an unseen branch and deflect? Dejected I walked back to the camper and relayed my story to Barb. She said lets go out and look again so we went back out into the rain for another look. We covered much of the same area and found nothing. As we were walking the back fence line looking for any sign I looked up and laying 20 yards ahead of me was the deer! It was obvious that he had been dead awhile so my shot had been good. We backtracked the trail and could not find any blood, the deer had traveled about 100 yards with no blood trail at all. Upon closer inspection I saw that the arrow hit a couple of inches higher than I was aiming and did not pass through so the blood stayed inside the animal. Dejection turned to elation as Barb and I hugged each other right there in the woods. After taking a few pictures, we loaded it up in the 4 wheeler and hung it in a tree for the night. The next day we processed the deer, packaged up the steaks and took the rest to the processor to make some sausage and burger. Now we need to find someplace to store all this meat! Next up is North Dakota to see our good friends Bob, Deanne, Chris, Holly and Bob and Sue for some farm work and with luck some ducks and bucks! Our First South Dakota Visitors! All work and no fun makes for a grumpy couple. Luckily we averted GCS (Grumpy Couple Syndrome) by infusing some fun into our week. After working all day, we started taking drives at night right at sunset to see if we could run across some of the area wildlife and boy, did we ever! Our most exciting events of the week was the fact that we had lots of visitors! Our first visitors were a local group of turkey’s who discovered that we put up bird feeders. Now they visit 3-4 times a day and have become so accustom to us and the dogs that they walk within 10 feet of us when we are outside sitting in front of the rig. Our first human encounter this week was dinner with friends Phil and Rudee, on Phil’s birthday no less! Phil and Rudee are originally from Indiana and were fulltiming RV’ers for over 5 years until they started their “summer” job at Crazy Horse Memorial just outside of Custer. They liked the job and area so much they decided to buy a house in Custer and have taken a temporary hiatus from life on the road and enjoy life in Custer for a few years. For dinner, we met them at Lintz’s Pizza in Hermosa. We are slowly but surely learning the places to go for good food in the area. Next up was a 3 day visit from virtual friends, bloggers and fellow fulltimers Jim and Diana Belisle. Although we had not personally met until this week, we have been virtual friends for several years following each other’s blogs and travel adventures. They have been on the road for about 3 ½ years and are passing through the area on their way back to their home state of Michigan after spending the summer in Oregon. They are a great couple, we spent one day visiting the Prairie Berry Winery for a wine tasting and the Alpine Inn for a great lunch. Then it was off to Crazy Horse Memorial. Having never been here before we were amazed at the size of this complex and the number of displays there were to see. And bonus, if you are from Custer County, you get in for free! They just ask that you bring a few items for the local food self. With the temps up into the 80’s most of the week it was hard to work past noon so we tried to get as much done early in the day and spend the afternoons running errands or doing other nonphysical activities. One afternoon this included a tour of the local 4 wheeler trails by the owner of Country Charm Cabins. Owen and his wife Lois have owned their campground/cabins and horse camp for over 15 years and know the local trails like their back of their hands so when Owen volunteered to take us on a ride, we could not say yes quick enough! He showed us a section line road where we could access the National Forest within a mile of our property. From there you can access literally hundreds of miles of trails. We saw some really cool country including an old homestead, an elk carcass and some beautiful scenery. Thanks Owen! This tree was growing right out of a rock! Work and Fun in South Dakota! Back when we were working we would often drive 8, 10 even 12 hours or more to get to our destination. Now our daily treks rarely get over 4-5 hours. We are not in a hurry, there are no deadlines so why push ourselves? MapQuest said our trip from Ontario to Pringle South Dakota was somewhere around 1,100 miles and 18 hours. We were so excited to get there we reverted to our former driving habits. Day 1 found us rolling out of Pasha Lake Cabins at 9:00 EST. 2 ½ hours later we were pulling up to the border. The crossing went without incident and we were headed towards Princeton Minnesota where we were scheduled to have dinner with our friend Joe. It rained most of the way, we stopped several time for fuel and to walk the dogs before we pulled into the restaurant at 7:00 CST. Day 1, 11 hour drive totally exhausted. We had a great dinner with Joe then headed to the local Walmart to park for the night. Let me tell you what a vast difference this day of travel made trading the sound of loons serenading us at night with the sound of trucks and traffic. We were already missing Canada but were equally excited about our ultimate destination. Day 2 we decided to take it easy, rolling at 9:00am and only drove 6 hours from Princeton to the Cabela’s in Mitchell, South Dakota. We walked the store (did not buy a thing! ), ordered Chinese food (disappointing) and just had a lazy evening. Day 3 we were up and rolling at 7:00am, 7 hours later we pulled up to the gate of our property, we made it! After setting up we went for a walk around the property. It was good to see that the prairie dog population did not double while we were gone. We also checked our trail cameras which had been out in likely hunting areas between our place and Kevin's since our last visit in July. 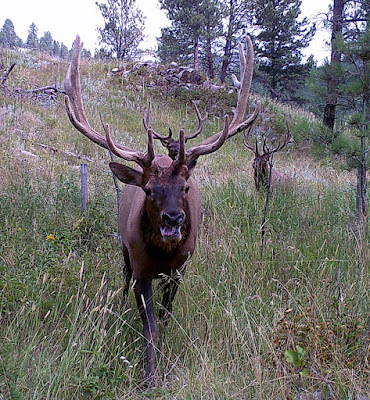 There were whitetail deer, mule deer, elk, turkeys and coyotes on camera, how cool is that!? That night when we went to bed, it was quiet, too quiet. No loons, no truck or traffic sound, nothing….we had to turn on a fan for a little white noise just to get to sleep! On top of that our bodies are still on Pasha time which is not only Eastern Time is it also get up early stay up late time. For the past two weeks we had been getting up between 6 and 6:30 and going to bed between midnight and 1:30am depending on how many bears came in. Now that we are in Mountain Time that has turned into getting up at 4:30am. I am sure that will change over time but for now it is kind of a pain. So here we are for the next 3-4 weeks. We have several goals we would like to accomplish while we are here. The main one is fixing and installing new fencing around the property. The current fence is in disarray and is a combination of barbed and barbless wire on 2 sides. We would like to remove all of it and put up high tensile electric fencing as we plan to lease the property to a local livestock rancher. There is a huge tax benefit to do this. So the next day we made a list of necessary parts and made the 1 hour drive to Running's and Menards in Rapid City for supplies. First on the list was a 50amp outlet, a breaker and some 6-3 wire for the rig. The temperature is supposed to get up into the 90’s later this week and we wanted AC! This project was not too bad and within an hour we were hooked up to power. Next up was fencing supplies, T posts, wire, splices, springs and ratchets. The first fencing project was to replace the fencing along the road at the front of the property. Barb and I spent several hours cutting down the old fence and pulling the T posts. The next day our friend Kevin arrived from Wisconsin to give us a hand for a few days. During his visit we were able to get the front fence line in and lay out the fence line for the east and west property lines. Let me tell you, this is no easy feat to draw 2,600’ straight line through the woods! 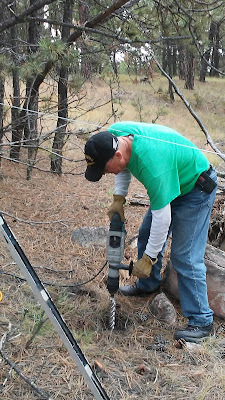 But with the use of our GPS and a chainsaw we were able to get enough stakes in the ground to see that we were installing the fence right along the property line. Over the next couple of weeks we plan on continuing our projects around here but we also want to make sure we get out and about and enjoy the sights of the Black Hills!